City in southwestern France, on the River Garonne, a little above its confluence with the Dordogne to form the Gironde; the seat of the gouvernement of Guyenne & Gascony, of a généralité and of a Parlement in the Ancien Régime. Its pays, the Bordelais, was roughly similar to the present Department of the Gironde, of which the city is capital. Originally the chief town of the Biturges Vivisci, a Celtic people, it was, as Burdigale, the capital of the Roman province of Aquitania Secunda. It was later part of the Visigothic Kingdom, and then of the Frankish Kingdom and its sub-kingdom of Aquitaine. In the troubled 8th and 9th centuries Counts were appointed to the Bordelais to counteract the power of the Gascon Duchy to the south, but when the sub-Kingdom of Aquitaine disappeared, the Dukes of Aquitaine were centred first in the Auvergne and then in Poitiers, and Bordeaux fell increasingly under Gascon control. During the last fifty years or so of the Basque Duchy of Gascony, the Dukes made Romance-speaking Bordeaux their capital. Their extinction in 1032 led to a long power struggle won eventually by the Dukes of Aquitaine, with the result that the centre of their power shifted from Poitiers to Bordeaux. In 1154 the husband of Eleanor, the heiress of Aquitaine, became King of an England that could not produce wine and so readily imported it from Bordeaux. 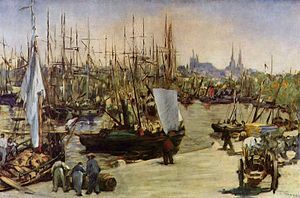 Not until 1453 was the link with England severed: Bordeaux, which had gained a great deal of self-government, was deprived of many of its rights for a while. The city became capital of the gouvernement of Guyenne & Gascony. The généralité of Bordeaux (originally at Agen, higher up the Garonne), which covered western Guyenne and Gascony, was created in 1542, when that for Guyenne was divided. Its extent varied: Béarn and Navarre in the Pyrenees were added from 1648 to 1682; the Gascon lands were transferred to a new généralité of Auch in 1716; the coastal regions of the Pays Basque and the Landes were lost to the généralité of Pau in 1767, temporarily returned in 1774, only to be lost again ten years later. Bordeaux was also the seat of the Parlement which had jurisdiction over Guyenne, western Gascony, Saintonge and Limousin. It was finally established in 1472; Charles VII had established a Cour souverain in 1451 as he advanced to the final conquest of English Aquitaine; for the next twenty years, with relations between King and City oscillating, the Cour souverain or a Parlement tottered from existence to extinction and back again. 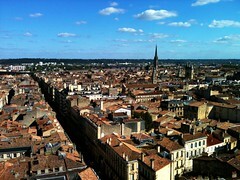 In 1790 Bordeaux became the capital of the Department of the Gironde. For a while in 1870, again during the spring offensive of 1918, and once more with the approach of catastrophe in 1940, Bordeaux was the seat of government for France itself. The city is the seat of an Archbishop, whose province before the Revolution was the old Roman province of Aquitania Secunda. Since 1790 the extent of the province has varied, though not greatly. This entry was posted in England, France and tagged Ancien Régime, Aquitaine, Bordeaux, Garonne, Gascony, Guyenne. Bookmark the permalink.